Undergraduate Research Fellowship: Support an undergraduate student as they delve in coastal engineering research. Research opportunities include laboratory, field and numerical modeling efforts under the guidance of CACR faculty. Summer or winter internship: Provide an opportunity for a graduate student to work in your office/facility for a short duration (to be determined). These opportunities give graduate students a practical immersive experience and may provide your group with needed expertise. Funding level based on location and duration of internship. 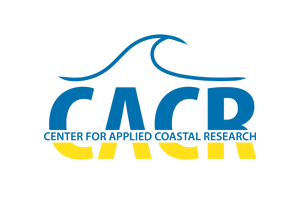 Industrial sponsor: Become a named sponsor by providing funds to help CACR grow/improve our world-renowned coastal engineering program. We also seek collaborators to work on coastal engineering problems of joint interest. Funding level starts at $5,000. Junior Faculty: Help us support hiring a junior faculty member to continue building our program and enhancing diversity: $1 million.